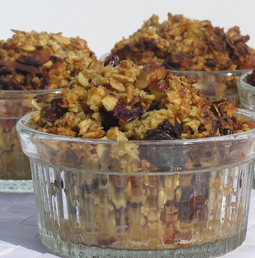 Apple Crisp - A recipe from Savor California, the online showcase for extraordinary gourmet foods and beverages from California. Combine and mix all ingredients including butter. Stir until well moistened. Bake in preheated oven for 40 to 50 minutes. Apple mixture will bubble and top will be golden brown.